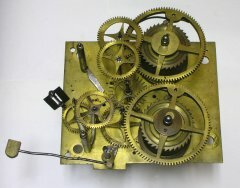 The 18th and 19th Centuries were the best of times for the English clock industry. 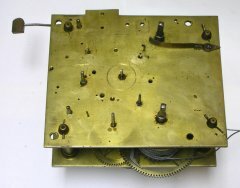 A few clocks were made in other parts of the British Isles. 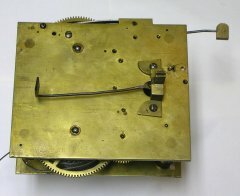 A few early American clocks were produced by immigrant clockmakers, resembling clocks from the countries where these clockmakers came from, and some American clocks look just like their English cousins. 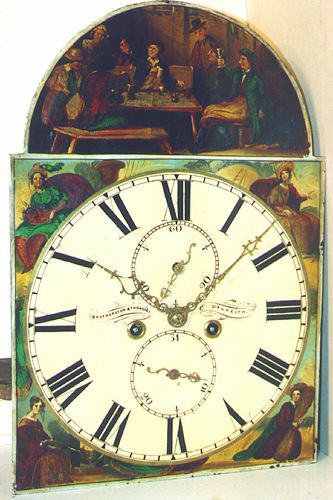 This English clock was made around 1750. It is unusually well made and heavy for a clock from that era. 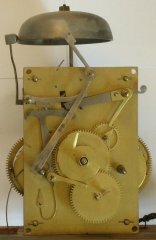 Two features that make this clock very rare are the Graham escapement and the long second hand in the centre (which is missing). 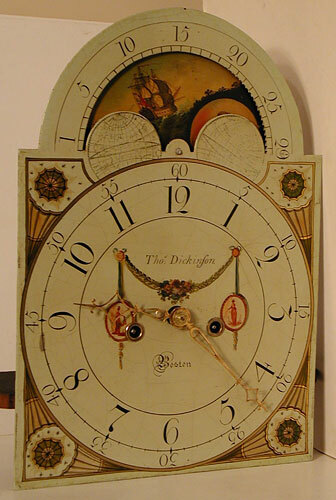 Most English grandfather clocks have recoil escapements and the small second hand under the number 12. 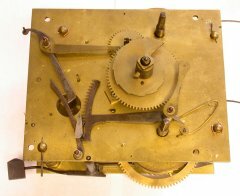 Many clocks from that era have problems with their designs, evident by the extensive repair work and modifications you can see on this clock. 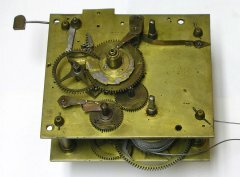 While the clockmaker made the Graham escapement correctly, he did have problems with the geometry of the rack and snail design in the strike mechanism. 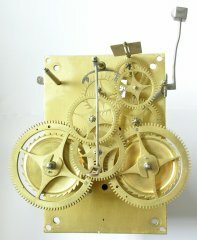 Thou shalt not covet thy neighbour's clock, but I have become weak . . . Dating your British grandfather clock. 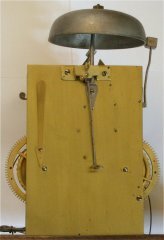 . .
"It's quite easy to date a painted dial longcase clock. Follow the simple instructions below and you'll soon get the hang of it. They fall into three distinct types, commonly known as period one (1770-1800), two (1800-1825) and three (1825-1860). The hour numerals are in Roman lettering (FROM I to XII) and the minute numerals are in arabic (5 to 60) numbered every five minutes (often called five minute numbering). 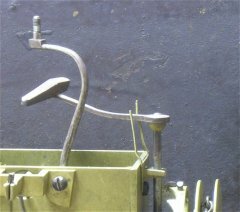 Period two dials start to lose the five minute numbering and this is replaced with fifteen minute numbering (15,30,45,60) possibly in slightly smaller size, around the hour numbers. The Hour numerals are often in arabic rather than roman style. Period two tends to cover the period 1800 to 1825-30. 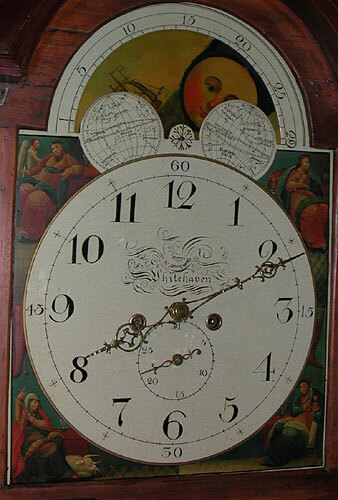 Period three dials are from 1830 onwards until the demise of longcase clockmaking about 1850-70. 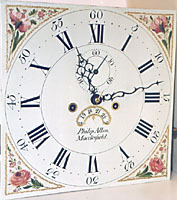 The minute numbering has disappeared completely and the hour numerals are back as Roman numerals, (I, II, III, IIII, V, VI, etc..) The corner decoration tends to be full colour scenes, often of country scenes, sometimes of the four seasons, countries (England, Scotland, Ireland, Wales) or the four continents. Sometimes there are specific corner or arch paintings to do with trade or commerce or perhaps with a religious or masonic theme." 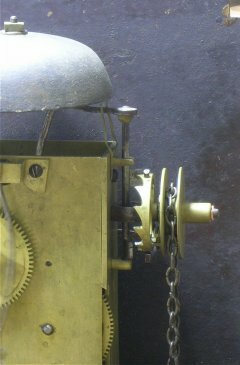 Here is an alarm mechanism on another English grandfather clock of the same vintage, ca. 1790. The basic design of this alarm goes back by maybe a thousand years! 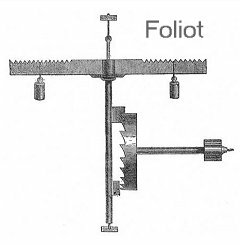 Here you can see the alarm hammer with the bell removed, and this is where the enormous significance of the alarm mechanism for the evolution of timekeeping becomes clear: if you add another hammer on the other side, you have a foliot, (developed around 1285).